The Secret to Sous Vide Cookery – If you’re still unclear on the specifics of sous vide cooking, or if you just want a quick and concise article to send to friends who still think that sous vide’s “just boiling meat,” this is a great overview of the technique. Beef Short Ribs With Mushrooms and Red Wine Reduction – A delicious winter recipe from our friends at SVKitchen.com. They’re always creating new and interesting dishes, so if you’re looking for some dinnertime sous vide inspiration (sous videspiration? ), SVKitchen.com should be your first stop. 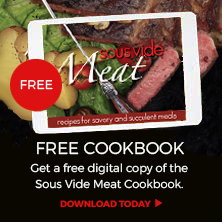 Leite’s Culinaria SousVide Supreme Demi Giveaway – Win a Demi in the color finish of your choice, thanks to Leite’s Culinaria and Chef’s Catalog. Contest ends in December. Part 3 of Al Dente Blog’s Playing Around With Modernist Cuisine -Leslie Kelly continues to play with her new SousVide Supreme, turning her focus (and temperature-controlled water oven) to Modernist Cuisine‘s duck confit. Brussels Sprouts Two Ways – The recipes don’t involve cooking the sprouts sous vide, but according to blogger Amy, both are excellent compliments to duck legs – and, as far as this blogger is concerned, any brussels sprout recipe is a good one. Bloody Mary Recipe with Bacon-Infused Bourbon – Ever drink a Bloody Mary and think, “This is good, but it’d be even better if it were more bacon-y”? Then this is the recipe for you, courtesy of West Hollywood’s favorite brunch spot and bar The Abbey. Jacques Pépin Comes to Washington – A wonderful interview with one of the original celebrity chefs, Jacques Pépin. Cauliflower Earns Student a Top Spot – We haven’t been able to find the recipe Richard Craig used for his award-winning Duo of Cauliflower, but it’s just further proof that sous vide cooking is accessible to chefs of all ages. And, if you’re looking for an alternate use for your vacuum sealer: individually vacuum sealing each soda can isn’t the most efficient (or eco-friendly) way to recycle, but definitely the most entertaining.